Located in the foothills of the Kiamichi Mountains, nature enthusiasts find ample activities to immerse themselves in at Beavers Bend State Park. The park, along with Broken Bow Lake, is located about 9 miles north of Broken Bow. 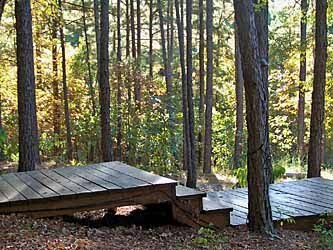 Beavers Bend State Park offers guests hiking trails that meander throughout the rolling pines and hardwoods. Also, the cool water from the Mountain Fork River flowing into the park, makes for great trout fishing. Canoes, kayaks, and paddle boats can be rented or vacationers can just take a dip in the crystal clear water. Come stay with us during the Labor Day Weekend. Spokane is now available for the Labor Day weekend due to a late cancellation. Three night minimum reservation required.